Why Do We Give Chocolate? 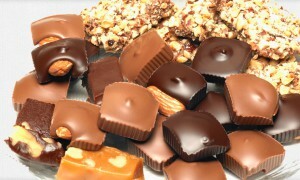 Thanksgiving and the Hanukkah and Christmas holidays are the busiest time of year here at Trappistine Quality Candy. Giving the gift of chocolate for the holidays has gone from trend to custom. When you’re up to your ears in cooking and baking for the holidays it’s nice to have someone else take care of dessert! A box of chocolates, fudge, or penuche makes a beautiful and delicious gift at the holidays, and never disappoints. Kids – from 1 to 92 – LOVE chocolate. C’mon, Admit it – when you receive those stackable boxes, filled with all kinds of holiday treats, don’t you open each one in anticipation of finding the milk or dark chocolates? Or a chocolate coated treat? And it’s assured that the little ones around your holiday table look forward with anticipation to a little after dinner treat. When it’s a chocolate pop a candy bar, or an array of chocolate squares, the kids are sure to clean their plates so they can indulge. As for the older kids, chocolate is perfect for carrying the unspoken message of love and romance. So it makes a great gift for that special someone who you don’t know well enough yet, but would like to. It’s a delight to share with a glass of wine or an afternoon cappuccino. Then, there’s always that person on your list who “has it all”. Since chocolates like ours tend to disappear quickly, even the toughest person on your Christmas list is bound to welcome a box of Chocolate Bark or Butternut Munch to enjoy alone or to share with friends. Our Trappistine chocolates make a delightful hostess gift, for dinner or any afternoon or evening gathering. But, the season’s not over on December 25th. There are number of other excuses throughout the year to share chocolate. Valentine’s Day and Mother’s Day are the biggest chocolate holidays of the year. But Trappistine Belgian Chocolates are given, too, at birthdays and anniversaries, Easter, and Father’s Day, and as hostess gifts as well. It’s guaranteed to delight you and your loved ones – that’s why we give the gift of chocolate, during the holidays and beyond!